It’s the new year, and I am thinking of workforce development issues for the next decade. Let’s give it a whirl in the next few posts. My company, Corporation For A Skilled Workforce has a mission of re-imagining work and learning. This frequently requires me to re-imagine my own job, but I am the fortunate one. It turns out in the next ten years people are going to have to learn new skills and re-tool more often than ever before. Here in Arizona, recently ranked dead last in job creation in the nation, the demand for an increasingly skilled and educated workforce is growing steadily. The region of Southern Arizona is responding to this situation with Innovation Frontier Arizona, a workforce development initiative led by the Pima County One Stop. But funding from the DOL WIRED program runs out the end of June. Despite the current economy and high unemployment we realize that unless we increase output from postsecondary institutions, the demand for college talent will exceed its supply, even here. Yet the Arizona state budget proposed by our governor contains truly draconian budget cuts that will ripple through every student’s future. Throughout the nation we are beginning to read that the jobless are overwhelming retraining programs. We recently celebrated filling all of our places for a logistics training program at Pima Community College, and I was delighted to see that logisticians are in the list of jobs with a more secure future. Many communities now have waiting lists of six months or more for job training programs. Prior DOL, ETA and stimulus funding has been spent, and many of those currently in training will be cut off July 1. Things are changing so fast these days, I often think . . . "we're not in Kansas anymore." By the way, Kansas has been a leader in workforce development. The Workforce Alliance of South Central Kansas has 1,100 workers on a waiting list because it has already obligated all the training money that was supposed to last until June, says board coordinator Amanda Duncan. Unemployed Wichita-area workers who sign up now for training for healthcare or other in-demand jobs could have to wait at least five months if the agency doesn't get any of the emergency grants it has applied for, she says. See this article on how the jobless are overwhelming training programs. Surrender Dorothy! With the reduction of educational funding, can you see this perfect storm brewing, creating perhaps systemic cycles of skills shortages and sustained high unemployment? So here in 2010 the number one workforce development solution increasingly means helping people to say: "I am an entrepreneur!" But what about all of these 20 year olds who cannot get the training they’ll need for now, let alone ten years from now? What is your strategy for workforce development 2020? Contributor Lewis Humphreys leads the Corporation For A Skilled Workforce's community transformation initiatives in the Southwestern U.S.
Should we teach Spanish to job seekers? Another tale from the job hunting front lines, this one from a friend of mine. Let's call her Maggie. Maggie has cobbled together several part time jobs and is putting in applications to grad school, to keep her options open. She's smart and hard working, and has raised two great kids to adulthood. She has a teaching credential and is thinking about re-upping her paralegal certificate. Right now, Maggie is struggling to get by. A couple weeks ago she took a test to apply for a job with the 2010 Census. There were 40 other people taking the same test with her, plus who knows how many other people in other centers in the L.A. area. All applying for one job. Maggie tells me she's not sitting by the phone waiting for a call back. Even after scoring 100 percent on the test. After scouring the job ads and putting in applications where she can for months, she's discovered she lacks one skill that could really make a difference - Spanish. She has passed on applying for any number of jobs where she meets all the other requirements, but doesn't speak Spanish. Ever open to new opportunities, Maggie asked me, are there any programs to teach Spanish to job seekers like herself? I seem to remember a program run by SEIU that taught Spanish to home health aides, and I've seen programs to teach basic Spanish for supervisors. However, I don't know of any other programs to help ordinary job seekers learn Spanish. Do you know of any workforce development programs to teach Spanish to job seekers? Should we in workforce development add this to our menu of services? Unemployment is de rigueur these days. I know that's not breaking news, but it's amazing how many employed people just don't get it. I've had two clerical job interviews where the interviewer asked me, in a shocked tone, why I hadn't worked in nearly ten months. At this point, I had to omit. Instead of saying, "I just finished my master's degree in May," I said, "It's really tough out there." Amazingly, one of those interviewers told me that her husband had been laid off for a year. The other one told me that her company just had two rounds of lay-offs. So what's with all the shock? What – you have a job and you haven't noticed the rest of the world around you? Probably not. Most of these interviews have been so trying. I just want a job to pay the bills. I can do any of the work employers require, both professional and non-professional, but until they decide to believe it, I'm at their mercy. Showing up for call-backs and group interviews where I'm the only one who even thought of not wearing shorts and flip-flops has been part of my routine. Once I went through a 35-minute interview with a tour and questions about my salary requirements only to find out, at the end, that the company wasn't actually hiring. They were just looking to establish a group of qualified applicants in case someone quit. Non-professional jobs aren't the only ones that have put me through my paces. I've had to submit a number of writing and multimedia samples to one employer with whom I've never actually spoken. The good thing about that is that it's given me a chance to re-edit some of my work and keep up with the latest technology. I also haven't had to drive round-trip to his office. Unfortunately, I have no idea how close I am to getting the job. I hear from him about once every two weeks and I keep supplying him with materials. Another employer I'd never met called me and kept me on the phone for nearly an hour. This particular guy asked me every question under the sun and told me at the end of the call that he actually had two positions open. Prior to calling me, he’d felt that I qualified for one, but lacked the five or more years of job-specific experience he wanted. He also wanted to pay less than $45,000 for a position that required a master's degree. Yes, really $45,000 a year for five-plus years of job-specific experience with a master's degree. He felt I was too qualified for the other job and would end up being bored. Why did he call me if he sensed all this upon reviewing my resume? I have no idea. The more important question is: why did I stay on the phone with him? I was unemployed. What else was I going to do? So, where am I now? A major retailer hired me part-time at a rate that should be criminal. I'm serious. I'm lucky enough to be living with family right now and, therefore, I don't have certain expenses. I don't have a spouse or children. I have no idea how anyone else is making it at minimum wage or even minimum wage plus commission. It is an absolute certainty that without the help of my family, I would be on public assistance in some way, shape, or form. It also appears that I will be starting another part-time job one of that major retailer's competitors. I'm pretty sure that this is not okay. But, it’s a living. An honest semi-honest living. This may sound strange, but I'm much happier than I was a month ago. No, I'm not using my degrees or working anywhere near my intended career path, but I'm earning a few cents of my own. I don’t have that sinking, suffocating feeling that everything is going to fall out from under me. I don't feel as though I’m so much of a burden anymore. More importantly, in my past when it's rained, it's poured. Usually when I've found a job, at any level, other employers start calling. We'll see. Something's bound to change. A couple of things already have. I'm probably in breach of an employment contract and, well, someone already decided my thoughts might be interesting enough for you to read. Guest blogger Anasa D. Sinegal hopes to find a long-term career in teaching or public affairs. She's blogging tales from the job hunting front lines all week on WorkforceDevelopments.com. They shoot the unemployed, don’t they? Going to Craigslist for job postings feels like that. I've typically only searched the site for administrative work, but in the last two months, I've actually seen two part-time, professional jobs geared toward me there. There are a whole host of issues with Craigslist, however. First, the bad news. Since Craigslist is free, there are all sorts of shady people posting ads for personal assistants in the administrative/clerical section. Anyone with any sense knows responding to one of these posts could be dangerous. I skip right over them. Recently, I've also noticed that there are a lot of spammers posting help wanted ads that send responders to Web sites asking for a ton of personal data. The Craigslist site administrators seem to be fairly vigilant in clearing these ads out once they've been notified of them. It's just unbelievable to me that anyone would think of preying on people who are desperate to work. Finally, some employers, possibly unaware of the current economic crisis, post their addresses, phone numbers, and "day of" interview times for job seekers. I call these cattle calls. When I've shown up to these businesses, I'm one of dozens of people waiting for a chance to have a five minute interview. I have yet to have anything pan out in these types of cases, although that's just fine with me. I honestly have to check my gut before I decide whether or not to go. I also tell a family member or friend about the location just in case. Now, onto the good stuff. Craigslist is free and when you're broke there's nothing better. I see the same jobs on Craigslist that I see on Monster and Careerbuilder – if not more. I'm also able to very easily toggle between several local cities and regions, making my job search as hassle-free as possible. There's good and bad with everything and I think I've been an informed job seeker. Hopefully that will get me even closer to my desired position. It's funny how much difference one year can make. It's scary just how quickly your view of the future and your status can change. Exactly one year ago today, I was in Europe. I had saved and saved and saved to pay for the three-week trip that I'd dreamed of for years. I actually had the nerve to think that international travel was something I could start doing on a fairly regular basis once I graduated and started my career. My prospects are entirely different now. Back in May, I was offered and denied a teaching position that would have provided entrance into my chosen career path. When the school's department chair emailed me and another candidate to inform us that we'd both gotten the job, he offered two possible teaching assignments: one was in-class instruction and the other was an online course. He then asked us to tell him which one we thought would suit us better. The chair told us that he had each of us in mind for a particular assignment, but was very open to placing us according to preference. Honestly, as soon as I saw that he'd emailed the offer to both of us, meaning I now had knowledge of the other candidate's private business, I knew the situation wouldn't end well. My family members were happy about the prospect of me teaching again, but I wasn't going to get caught up in the excitement. The chair's correspondence just seemed too unprofessional. I was right. I responded solely to the chair and told him about my preference for in class instruction. I made certain to be clear that I was thrilled with the opportunity to be a part of the X College community. I also let him know that I was confident that my education and training would make me a wonderful instructor and that I was enthusiastic about teaching his students in an online or in-class format. He replied to both of us, a week later, that neither of us (the original two candidates) seemed enthusiastic about the online class and that he'd decided to cut me from the part-time group of candidates and offer the job to someone else who was already teaching a "brick and mortar" course. He did let me know that he tried to get the third person to switch his brick and mortar course with me. Surprisingly, in this economy, Mr. Brick and Mortar was willing to take on an online course that he could easily teach at home while sitting in his underwear. In that email, Mr. Department Chair then went on to tell candidate number two that he looked forward to working with him and that they should schedule a luncheon or get coffee together at some point. Yes, my rejection was not done with a private phone call or even with a form letter, but in an email with a third party. I was angry and shocked at the level of unprofessionalism. Previously when I'd taught part-time at a state university, each semester I received a personal letter detailing my teaching assignment, hours, and rate of pay. Perhaps I was wrong to expect the same treatment at another institution. This breach of my privacy caused me to take a three month break from job applications. I decided in late May to consider the summer of 2009 a break typical for college students. I didn't even attempt to find part-time work. I figured I wanted to have some type of employment by the first week of September, even if that meant working at a cash register. During the summer months, I also worked on applying for PhD programs for Fall 2010. That long-term goal made things a bit easier and allowed me to really think about what I wanted to write in my college essays. Eventually, I came up with the three-prong plan I detailed in a previous entry. More on its successes, failures, and the hilarity of it all tomorrow. What's the biggest difference in my professional and non-professional job searches? Omission. Lots and lots of omission. I have omitted the majority of my work history when applying for non-professional work. In January my cousin told me, without hesitation, that I wasn't finding work because I was actually listing my full education and experience on resumes I sent to employers filling administrative and clerical positions. Of course, she was absolutely right. The minute I restructured my background, I was hired for a temporary filing job. It didn't feel right, though. I thought they would see right through me. They didn't. My professional resume and cover letter are not embellished at all. I've been extremely thankful to have my former graduate adviser give me some wonderful guidance with them. It's also critical that I have a Curriculum Vitae for academic work and I've finally gotten that to the point where I'm happy with it. Since I have two degrees in the field of communications, I search the job postings on professional sites like JournalismJobs.com and HigherEdJobs.com. A friend of mine from grad school told me about usajobs.gov, the clearinghouse for all the government jobs, so I've got my resume up there, also. My graduate adviser recently told me about idealist.org, a site catering to people seeking non-profit employment and volunteer opportunities. I probably apply to one or two professional jobs per week through these sites. There just aren't too many opportunities out there. When I apply for non-professional work, my resume includes the retail and administrative positions I've held since I began grad school. I've also tailored my professional jobs to read as though I had been performing clerical work or assisting my co-workers. Obviously, I've told my former employers and co-workers what I'm doing so that they don't blow my cover when they’re contacted for references. In terms of education, on non-professional applications, I'll write that I've attended "some college." I use the community college I attended during my summers in undergrad to back this up. For administrative work, I've found 95% of my help wanted ads by searching craigslist.org because it's free. I don’t post my resume on craigslist mainly because of the same reason. Free doesn't just mean "at no cost," it can also mean free of the filters that will keep the "Craigslist Killer" from contacting me. These jobs don't often call for cover letters. When they do, I keep them very short. I actually have a form cover letter that is all of two paragraphs long and – maybe – a total of six sentences. Most of these places just want a resume. So, I have about ten emails in my draft box ready to go with two simple sentences about how professional, reliable, and experienced I am. I make sure to refer to the specific position title in the subject line, attach a copy of the resume, and paste my resume into the body of the email below my note. Occasionally, an employer will ask for salary history and requirements and I'll attach those, also. When I'm at home during the day, having this system of form responses makes it really easy for me to fire off a resume as soon as a new posting pops up. At times, I have literally pounded the pavement for non-professional work. Retailers and restaurants don't tend to post on craigslist so I have to seek them out. I actually like this method a lot more than the purely electronic approach. Why? There may be a chance that you'll see the manager in the building and you may even be able to chat him or her up. The only problem with this system is gas money. I'm not working so I don’t have any. In the end, I'm still trying to convince someone to put my resume aside out of the dozens, if not hundreds, they receive on an hourly or daily basis. Here's my story and I'm sure I'm not alone in this. I graduated in May with a master's degree in the communications field. The 2008 – 2009 school year was a long and challenging one filled with personal and professional difficulties and triumphs. I was excited to start my life, start a long-term career and finally make my way in this world (you're picturing me tossing a beret into the air right now – admit it). Right as I graduated, a department chair of a small school offered me a part-time position teaching in my field. It wasn't tenure-track, but it was paid employment in the exact area I'd planned on working. How exciting! I'd be working during the fall semester and planting the seeds I'd need to begin a career in education. The department chair rescinded that offer in a truly unbelievable manner that I'll discuss in another blog entry. That event left me a bit dejected, but allowed me to focus on researching PhD programs that would start in the fall of 2010. I developed a three-prong application process that I started in late June. The first was to continue the pursuit of college teaching jobs throughout the country. Second, I would really hone in on exactly what I wanted in a doctoral program. Third, in August, I would begin looking for full and part-time administrative, clerical, and only if I was dead broke, retail work to pay those pesky little bills. Plans one and two kept me busy and motivated for a good two months. It was also rather nice to have a couple of months to myself. I was free to go swimming at a friend’s house on a moment's notice, go to parties, and get back into consistent exercise. Then August rolled around and I was ready to make some coin and I needed plan three: part-time employment. I hit Craigslist just like I had done several times throughout the last six years. This time, it was different. There wasn't much out there. Now I haven't done any statistical research on Craigslist's ads in the last six months, but it seemed as though there weren't as many listings as I'd seen in April, the last time I'd gotten a temporary job. Undeterred and really not too worried, I plugged away at submitting resumes to employers via the site. Then, on August 20 I heard loudly and clearly for the first time how much I needed a job. I knew my financial situation down to the dime. But, hearing the automated voice of my credit union tell me, in no uncertain terms, made it official. I'm pretty sure I had a stroke. Those feelings of suffocation and anxiety made me long for the days when I struggled to live paycheck to paycheck after undergrad. Oh. Good times. And so I search for jobs to get me through the rough patches while I hope for a real career and a chance to become a vested member of some organization. Guest blogger Anasa D. Sinegal hopes to find a long-term career in teaching or public affairs. WorkforceDevelopments is pleased to welcome guest blogger Anasa D. Sinegal, one of millions of Americans who will hit the pavement looking for work today. She'll be blogging all this week about what it's like out there on the front lines of the worst economic crisis since the Great Depression. And she has some great stories to tell. I invited Anasa to WorkforceDevelopments because in these tough times it's so easy to get caught up in the labor statistics game and lose the human details. Behind each one of those millions of Americans who's looking for work is a story as unique as Anasa's. Anasa earned an A.B. in Journalism/Mass Communication from the University of North Carolina at Chapel Hill and an M.A. in Mass Communication from California State University, Northridge. Note to employers and recruiters: Anasa is seeking a long-term career in teaching or public affairs. In the meantime, Anasa tells me she's working for the weekend in a retail position. If you have stories to share from your own job hunt, please add them in the comments. This past year I have observed the growing use of a new word to describe the recession - "mancession" - a neologism the New York Times blog Economix has adopted to describe the phenomenon of an unprecedented growing gap between male and female unemployment rates. (I could find no earlier attribution or source for the term, but invite you word mavens out there to find one.) According to the latest from the Bureau of Labor Stats,"the gap in the male-to-female jobless rate is at a record high: 2.4 percent — 10 percent for men and 7.6 percent for women." I don't really like the term mancession, and offer "sheconomy" as an alternative view that accurately describes women's labor force participation in occupations that are not as hard hit by the recession. Catherine Rampell of the Economix blog tells us "that recession has disproportionately hurt men, who are more likely to work in cyclically sensitive industries like manufacturing and construction. Women, on the other hand, are overrepresented in more downturn-resistant sectors like education and health care." Many unemployed men continue to be unable to find any work at all, let alone work with compensation comparable to their last position. A mancession doesn't really refer to the recession, but more literally describes the cessation of employment of many men. More economists, workforce professionals and bloggers are beginning to understand the severity of this problem. It is a rapid, complex shift in the gender make up of the U.S. workforce and this news is coming at us way too fast. Social media and workforce development: Will welders tweet? With the recent events in Iran, the tipping point for Twitter as social innovation has happened. Most likely if there is a successful change of power in Iran, it will likely be known as the Twitter revolution. Throughout the world there is a new awareness of how people use social media to transform everything, from knitting to the US Army. In June, Army officials ordered U.S. bases to stop blocking soldiers' access to some of the most popular social-networking sites. As reported on Wired.com, the order states: "The intent of senior Army leaders to leverage social media as a medium to allow soldiers to 'tell the Army story' and to facilitate the dissemination of strategic, unclassified information, the social-media sites available from the Army homepage will be made accessible from all campus area networks." As I watch the adoption of social media by various government agencies I think: Why not workforce development? This is the question I am posing to my community as we tangle with the enormous challenge American workers face in our rapidly shifting and unpredictable economy. Here in Tucson, despite the downturn, some employers are still having trouble recruiting key high tech workers because of skills gaps. We're creating the WIRED Innovation Frontier Arizona (IFA) regional knowledge exchange in response. This is an innovation collaboration platform intended to transform workforce education and training programs and enable them to be nimble enough to keep pace with employer needs. The IFA regional knowledge exchange builds on the development of entrepreneurial collaboration platforms for WIRED regions in Mid-Michigan and Southeast Michigan where CSW and WIRED partners have created WeToo, a feature rich social networking site that supports the regional WIRED goals and objectives. The Arizona office of the Corporation for a Skilled Workforce (CSW) has entered into a partnership with the University of Arizona's Eller College MIS program to create the regional knowledge exchange. The WeToo Research and Development Lab has been established to support workforce development strategies for four counties in southern Arizona. Eller MIS students are working together with CSW, academic faculty, government agencies and private sector partners across the region to launch the new online collaboration platform later this summer. The new WeToo platform will support innovative workforce education and training initiatives across industry sectors. This is the first time the academic institutions, One Stops, economic development professionals and employers in the different communities have worked together to create joint workforce development programs. It includes a rural entrepreneurial education program that will transform the lives of many young people in our area who previously didn't have access, to one of the best entrepreneurial programs in the country at the University of Arizona. The WeToo regional knowledge exchange will support WIRED objectives to facilitate project collaboration, sharing and archiving information, creating virtual work spaces, and assist partners in attaining benchmark goals. As we work together in creating the knowledge exchange we're confronted with concerns about community adoption of the platform and users adapting to new work methods - issues confronting the workforce as a whole. Once again the way work is done is being transformed by technology, but it is happening with such rapidity that the time honored necessity of keeping one's skills up to date is virtually impossible for the majority of workers. Not to mention those of us who do our best to learn the utility of all of the proliferating apps we download to our desktops or into our BlackBerrys, iPhones and Google phones each week. Our task is to help workforce development professionals use technology to address this vexing problem of skills shortages in a time of high unemployment, as reported in the New York Times "Despite Recesssion High Demand For Skilled Labor." Will welders tweet? It seems unlikely, but social media is helping everyone be more nimble in responding to the workforce development challenges at the end of the naughties. This is something workforce development professionals should be paying attention to. Guest blogging this week is Susan Crane, Executive Director of Port Jobs in Seattle, WA. Port Jobs is not-for-profit action tank that develops practical programs and supports public policies that increase access to living wage jobs, fostering a more vibrant and equitable economy for residents of and businesses in Seattle and King County. In his first address to Congress earlier this year, President Barack Obama rocked the workforce development world when he said, "Tonight, I ask every American to commit to at least one year or more of higher education or career training." If you have to ask what's so groundbreaking about that, you probably don't work in workforce development. For one thing, he said the words "career training." President Obama was saying better jobs skills for Americans will be a key factor in turning from economic downturn into recovery. For another thing, he didn't say "get a four-year college degree." Most elected officials seem to think a four-year college education is the only pathway to success for individuals and for the economy at large. By talking about one year or more of training or education, President Obama was telling the country that shorter degrees and certificates for jobs like plumber, paralegal or licensed practical nurse are just as important. In workforce development, we've known that for a long time. Studies show that in my state, Washington, a student who gets at least some college education will earn $222,000 more over a lifetime than a student who only graduates from high school. If that person completes an associate's degree, she'll learn $323,000 more. Research also shows that both in Washington and nationally, "middle-skill" jobs that require more than a high school education but less than a college degree will make up the largest share of job openings from now until 2014. That's 49% of all job openings in Washington state and 45% of all job openings across the U.S. But here's the dilemma. To get the kind of career and technical training President Obama was talking about, many Americans will turn to their local community colleges. This is where many people get training to become an aircraft mechanic, truck driver or computer technician. Are our community colleges prepared to ensure that the students who enter these training programs complete their degrees? Many of those will be working adults with families. Many of them will arrive with limited previous education, and may lack basic reading, math or language skills. Research in our state shows that some 60% of older first-time students age 25-60 drop out of college without ever earning a certificate or degree. If we are to rebuild our economy, we have to do a better job of making sure those students succeed. This Friday, Port Jobs will host an event sponsored by the Seattle King County Workforce Education Collaborative, bringing together leaders from our community and technical colleges, private career schools, foundations, government agencies, community-based organizations and workforce development agencies to discuss how we can do just that. From the Work Station to Graduation will discuss best practices and emerging new paths to college success for working adults. This week I'll be writing more about these issues. Tomorrow I'll write about how the jobs that will be created by the American Recovery and Reinvestment Act (ARRA) will fit into this larger picture. On Thursday I'll write about budget cuts at the community colleges and how they could affect student success. On Friday I'll write about the role that community-based organizations and workforce intermediaries like Port Jobs can play in helping working adults succeed in school. As older workers retire and younger workers opt out of maintenance jobs, how will we keep schools, factories, hospitals and other facilities running? Some experts say there just won't be enough trained maintenance workers in the U.S. to meet labor demand. As this song asks, How safe does that make you feel? If you don't see the embedded video, click here to watch it on YouTube. My local public radio station, KPCC, had a great story yesterday about one medical specialty with a bright future: geriatrics. With the U.S. population aging, it's a growing field. Unfortunately, it's not "cool" and it doesn't pay as well as many other specialties. I really enjoy taking care of older people and I enjoy just what a geriatrician does, which is, you know, how you imagine a doctor to be: you get to know a person. You focus on the person, rather than, you know, this lab value, that lab value. You get to know their families. Remember when going to the doctor was like that? We're going to see a shortage of geriatric specialists soon. Fewer people are choosing the profession, while we're all growing older. It's not just doctors, but nurses, techs, aides, physical therapists and anyone else who provides medical care. For that matter, it's not just medical care. A friend recently said she was thinking about starting a small business to provide personalized services like picking up prescriptions and groceries for folks living in two assisted living centers near her home. In other words, careers helping people grow old with dignity are ones to keep an eye out for, both for you and your job seeking clients. To read the KPCC story, click here. You'll find audio and other web links as well. For other pieces on solutions to the looming shortage of geriatrics caregivers, click to The Century Foundation and the Association of Professors of Medicine. Another industry that's poised for high labor demand is energy. I wrote about a projected shortage of line workers a while back, but concerns aren't limited to that occupation. Whether you're talking about jobs in traditional electrical utilities or the emerging new field of green energy, growing demand for electricity (check out the table below) combined with baby boomer retirements means jobs will be opening up. Here are two resources workforce development professionals may find useful in helping inform and direct job seekers to opportunities in the energy sector. For old-fashioned energy companies, check out the Center for Energy Workforce Development (CEWD). They have an interactive website where, in addition to the articles, videos, curricula and other materials you'll find there, CEWD encourages you to add your own materials and best practices. It looks like there's a fee to join, but you don't need to be a member to access much of the info. The Apollo Alliance focuses on green jobs and green energy, and their website has a wealth of information, including this recent report on "green collar" jobs. You can join the discussion on the Apollo blog. In addition, WIRED Nation is currently setting up an Energy Regions section on its wiki, similar to its sections on Bioscience and Transportation/Distribution/Logistics. It will be yet another resource you'll want to bookmark. If you know of other resources on jobs in the energy sector, please pass them along. Couple weeks ago I went to hear Deloitte CEO Barry Salzberg give a talk titled: Who Took My Workforce? New Realities for a New Era. The talk took place over lunch at Town Hall L.A. He quoted some sobering stats. By 2015 there will be a shortage of 10 million workers. American companies won't just be competing for workers by city and state - the labor market is global. "The war to find and keep good people continues." Gen-Yers, who take a consumer's view of employment: Give me good reasons why I should invest my time and energy in working for you. The Gen-Y group asks questions that drive the other generations crazy: Why should I do this grunt work? Why do we have to do it this way? Can't we use technology to have fewer meetings? Moreover, they grew up in an era of mass layoffs and corporate scandals, so when businesses say they care about people and are trying to protect the environment, they're deeply skeptical. What can businesses run by Boomers do to hire and keep talented Gen-Y workers? Salzberg offered a "3-Rs, 3-Cs" formula. Show them respect, recognize them for their hard work, and give them a opportunity to do work they'll be remembered for. Coach them rather than find fault, consult with them rather than order them about, and give them a opportunities to connect with co-workers and their community through their job. The workers Salzberg describes are tech-savvy, well-educated and poised to lead major international businesses. But trucking firms, home health care agencies, electrical authorities and construction companies all project trouble meeting labor demand as the baby boom generation retires. In the Q&A, I asked Salzberg whether his rules apply to all workers in all workplaces, or just to newly-minted MBAs. He said he didn't have the data to answer that question, but suggested studying the demographics, needs and interests of workers coming into those jobs. We can't take a one-size-fits-all approach. Which leads me to ask these questions: Is there a role for the workforce development system in helping employers understand the needs and interests of our future plumbers, nurses aides and longshore workers, the way Salzberg explains the needs and interests of future accountants? Do we need to have a better understanding of generation Y if we're going to effectively help them find and keep good jobs? Can you afford to work for a nonprofit? The new edition of the Chronicle of Philanthropy (reg required) has a series of articles about a new study that finds nonprofits will have trouble filling leadership positions as the baby boomers who run them today retire. Workforce Developments readers (and just about anyone else paying attention) know this is a burgeoning labor problem, not just in the U.S., but wordwide. No kidding. Don't we all know somebody running a nonprofit whose life looks like that? My question is this: What role do the foundations, government agencies and donors who fund the work of nonprofits have in keeping salaries so unreasonably low that more people are less interested in running them? I know it's important to make efficient use of public resources, but is it good policy to pay nonprofit employees so little that they can't afford to buy a home? I did a little research. I collected management level job descriptions in California from Idealist.org (great job search website). Then I compared monthly salaries with what it would cost to buy a median-priced home there with a 30-year fixed mortgage at 7 percent with a 20% downpayment. These are before-tax salaries. Take-home pay will be less. It's clear, even if some of these people bought a home with another person making the same salary, they still couldn't make the payments and eat. We won't even talk about their share of health care premiums. When a foundation or government agency reviews a proposal, do they look at the proposed salaries? Do they compare them to the local cost of living? Maybe they should do that before clutching their chests over paying an Executive Director more than $100,000 a year. I believe funders should get out of the business of supporting nonprofits that undercut their own employees in order to compete for grants and contracts. If they want a nonprofit to do the work, they should pay what it costs to hire and keep talented staff. That's one way they can help nonprofits build sustainable leadership for the long haul. It's time to update your labor market data, and it might be time to reassess your job search strategies. It also might be time to reconsider when you plan to retire. The Bureau of Labor Stats has issued new employment projections for the 2006-2016 time period. BLS estimates total employment will grow by 15.6 million jobs, or 10 percent. That's slightly less than the 15.9 million jobs created in the 1996-2006 decade. No real surprises in the data, but in some cases it's stunning to see the hard numbers. For example, the number of 55 and older workers is expected to rise by 46.7%, more than five times the growth in the labor force overall. By 2016 they'll make up nearly a quarter of the nation's labor force, almost double their share in 1996. Getting onto AARP's "best employers" list is going to become much more important for businesses looking to hire. 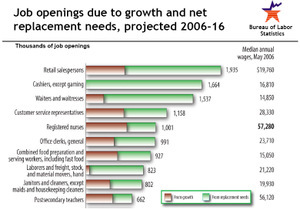 Opportunities in service occupations in industries like health care, retail and food services will rise, although how many will be new jobs and how many will be replacements for people leaving those jobs varies significantly. See the attached chart. BLS expects wages in Health care and social assistance, Business and professional services and in Educational services to each rise more than 20% over the next decade. In Manufacturing, wages will decline by 11%. For the press release and all the info from BLS, click here. What jumps out at you from this list? How about six of the top ten are in health services, a high demand industry where many employers are experiencing a shortage of skilled workers. If I counted right, about 20 of the top 50 (40%) are health-related employers. Two of the top ten are in financial services, another industry with high labor demand. If you look at past years' top 50 lists you'll see a lot of the same employers repeated year after year. Is that because the best remain the best, or because not enough employers know about this list? All US companies with at least 50 employees are eligible to apply. Here's how the top 50 were selected. For the full list of this year's honorees, click here. You can also see the lists from 2006, 2005 and 2004. If you've been looking for just the right gift for that workforce professional in your life, your search is over. Well, maybe. For years I've struggled to explain to people what I do for a living. I can keep it simple by saying, I help people get good jobs. But really, it's more than that. In workforce development we also help businesses find skilled workers, and we help strengthen the local economy by ensuring both businesses and workers thrive. Not too bad, I thought. 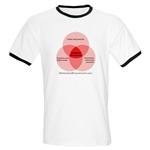 So I headed over to CafePress.com and put it on a t-shirt. Then a mug and a few other items as well. 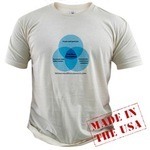 I've set up a shop at CafePress.com/workforcedev, where you can buy stuff emblazoned with this workforce development image. I'll donate 5% of the price of every item purchased to the Garment Worker Center here in Los Angeles. Click here for more details about pricing and products, or just click over to the shop. I'll admit, I'm better with words than visuals, so this diagram is pretty simple. If you have an idea for a image that helps to explain what workforce development is, I'd love to share it here on the blog. Got an email from a colleague yesterday telling me about an item in the Chronicle of Higher Education she thought I might be interested in. The Chronicle of Higher Ed? I always thought that was an outlet for news and info for those in the rarified ivory tower air of the four-year-and-more institutions. The headline read 'Middle Skill' Jobs Are Plentiful, Report Says. I followed the links, which took me straight to the new Skills2Compete report from The Workforce Alliance, America's Forgotten Middle Skill Jobs by Harry Holzer and Robert Lerman. Unfortunately I don't have an account with the Chronicle so I can't provide a link directly to their brief story. Mostly, it covers key points from the report, like "the idea of an 'hourglass economy,' where most jobs require either highly educated or low-skilled workers, just isn't true." Perhaps I had it wrong about the Chronicle. I'm delighted to see TWA's work getting coverage outside the usual workforce development outlets. On a mostly unrelated but interesting note, the current Chronicle offers some labor market info on university presidents. At the biggest four year research institutions, presidential pay starts at nearly half a million a year. Again, I can't link to the full story, but a Buffalo News piece covers the main points.